Stanbridge University Expands VR Lab with Anatomage Table. Stanbridge University is pleased to announce the addition of the the most technologically advanced anatomy visualization system in the world to its Virtual Reality Lab. Stanbridge students can now utilize this rare and innovative tool used by the top hospitals and medical facilities. The Anatomage Table is the only fully segmented real human 3D anatomy technology system. Users can visualize anatomy exactly as they would on a fresh cadaver. Individual structures are reconstructed in accurate 3D, resulting in an unprecedented level of real accurate anatomy, dissectible in 3D. The Table allows for exploration and learning of human anatomy beyond what any cadaver could offer. Schools that utilize the Anatomage Table are showing higher test scores, more efficient class and lab sessions, and student acceptance, according to Anatomage. 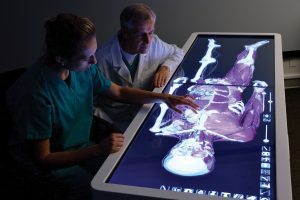 The Table allows students to interact with young and well-preserved digital cadavers instead of decaying physical bodies. The accuracy is unmatched and keeps students’ interest and attention better than previous teaching tech, leading to more effective educational outcomes. This addition expands Stanbridge’s resources for innovation and technology in the classroom with hands-on training and the largest digital database for actual cadaver scans and information. The Vocational Nursing, OTA, MSOT, ADN, PTA and Veterinary Technology programs are able to use this to virtually dissect actual human cadaver scans and a variety of animal cadaver scans. Stanbridge University already offers students of its Nursing and Allied Health degree programs access to several technologically advanced skills labs on campus. The Nursing Simulation Lab, Synthetic Cadaver Lab, Synthetic Canine Cadaver Lab, Advanced Driving Simulator Lab and Electronic Medical Record stations also enable students to master industry-relevant skills and critical healthcare technology. The Anatomage Table is yet another welcomed educational and technologically advanced tool available for all students. To learn more about Stanbridge University’s nursing and allied health programs, please visit www.stanbridge.edu.